You woke up this morning with blurry eyes and started scrolling on your phone. 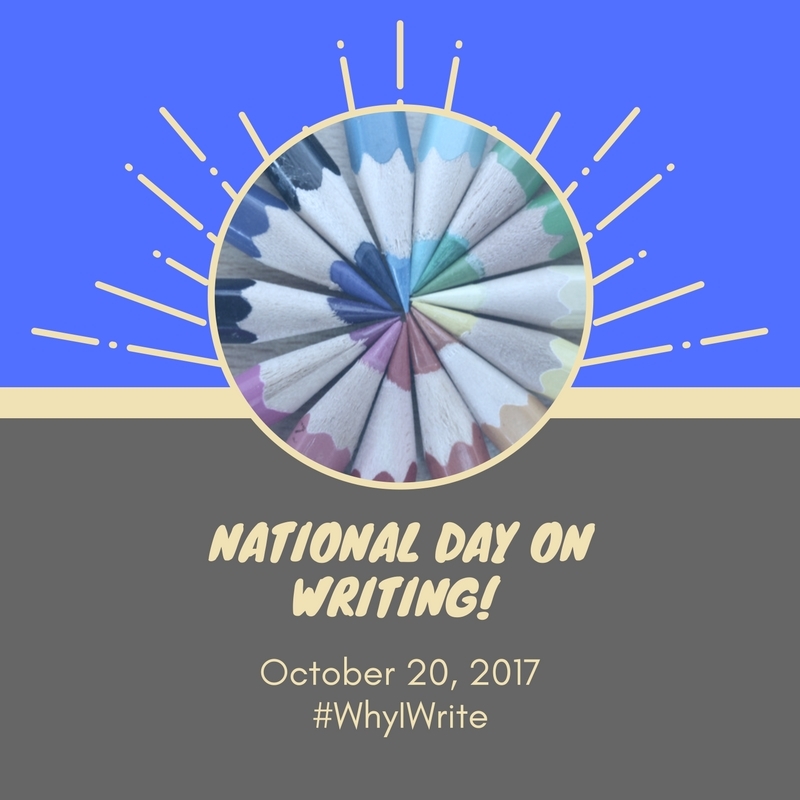 Twitter is abuzz with #WhyIWrite and it hits you…IT’S NATIONAL DAY ON WRITING! What now? You could think to yourself, I didn’t plan for this, oh well, maybe next year. You could start thinking of elaborate plans, things you wanted to do but didn’t have time to prepare, get super overwhelmed and then give up. Do you want a third option? You could try a quick celebration that takes limited materials, little time, but will give a nod to the day and add a little fun to your Friday. I say, go with door number three if you haven’t already got something in the works. What to do: Get out the sidewalk chalk and have a little #chalkabration celebration on your school sidewalks, blacktop, or even some black paper. Students can take a favorite line from a recent piece or publish a poem from their notebook and write it for all to see. Younger students may enjoy illustrating a favorite poem or classroom collaborative poem. What to do: With older students, in a small group, write a line of poetry or a partial line and pass to the next person to create a small group collaborative poem. When all the lines are written, as a group, make revision decisions, addition/deletions and polish up the poem. With younger writers, use this as an opportunity to share an interactive writing experience with poetry. Choose a topic and have students pass the marker to come add a word or phrase with teacher support. What to do: Look up the word of the day (there are many choices, just Google “word of the day”). As the teacher, you can choose the inspiring word of the day if the internet lacks intrigue. Ask students to create a word cloud in their notebooks. Students can generate synonyms, antonyms, or word association word clouds based on the word of the day you share. You might need to pull up an example of a word cloud image to share with students. 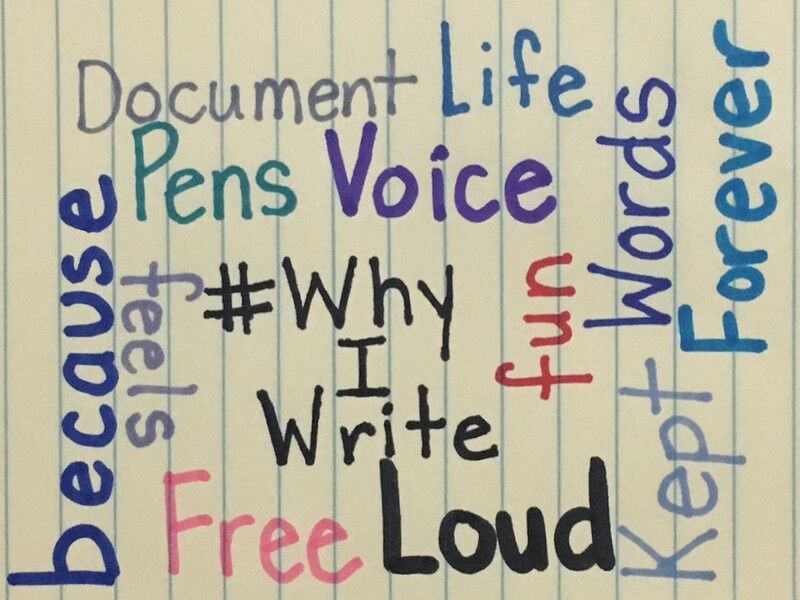 The word cloud I created as the featured image for this post was inspired by #WhyIWrite which is the theme of this special day. What to do: Grab some paper off the paper roll on your way to your classroom. Write the phrase, #WhyIWrite in the center of the paper. Put some markers in a cup near the paper after you attach it to a bulletin board or wall. If you don’t have paper on a roll at your school, a whiteboard works too. Just take a picture when students are finished. Throughout the day, as students have a free moment, they can write a short response to the prompt, #WhyIWrite on the paper. Time Commitment: As much or as little as you like. What to do: Check out the wonder of the day at Wonderopolis. 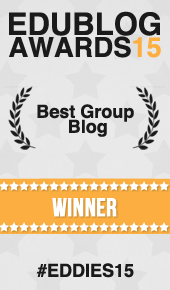 As a class collaboratively with younger students, or in small groups with older students create a Wonderopolis entry. Another thought would be to generate a list of questions and wonders. This would be a great list to revisit during a research unit. What to do: Give students a piece of paper and ask them to draw a picture of themselves in their favorite writing spot. Students can write a description below their illustration. With younger students, you might create a pattern book, such as “I like to write in my _________” or something similar. For older students, you could have them think of a way to describe their writing spot using a simile “My writing spot is as cozy as a comforter.” As students finish their individual book page, collect the pages and staple them together. Put on a cover highlighting National Day on Writing and voilà, you have a book. Last year I used some of the ideas shared by Kathleen on National Day on Writing. 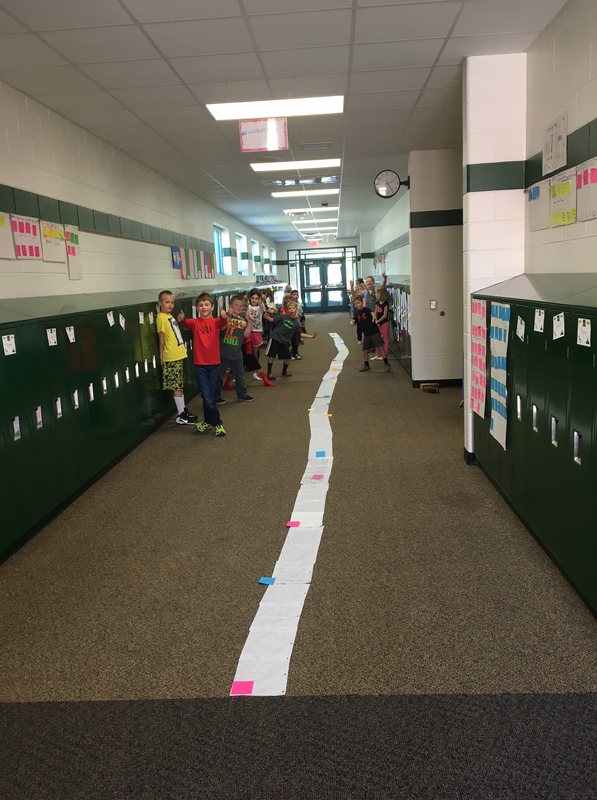 My favorite was when my students wrote as many words as they could in ten minutes and we measured the length of all of our words and pages taped together. It stretched the hallway. Check out both Kathleen and Anna’s ideas from the past two years if you have a little time on your hands today. If not, steal one of the ideas above. Any of them can be shortened down or lengthened out depending on your schedule. Most importantly, celebrate your writers and celebrate writing today. Make it a priority and it will be one. These last-minute ideas are beyond awesome! Very manageable and sure to make kids remember this important day. thanks Betsy! Such great and doable writing ideas for National Day on Writing. Thank you, Betsy! Great ideas. I’m definitely going to do at least one of them.